Are you looking to install a water heater, but worried about how much it will cost? Well, the cost to install a tank water heater in Phoenix ranges from $900 to $1,500+. Water heater size or capacity refers to how many gallons of water a tank can hold when it’s full. The more gallons of water your heater can hold (and heat), the bigger it is. And the bigger the water heater the more expensive it will be. But here’s the thing: you don’t get to choose the size you want. Instead, you have to find the size that accurately matches your hot water needs. So instead of just guessing and choosing a water heater because it’s cheaper or bigger, you’ll want to find one that fits your needs. This method provides a good estimate as to what size water heater you’ll need. For more accuracy, you’ll want to calculate your home’s peak hour demand to determine what size water heater you need for your home. Peak hour demand refers to how many gallons of hot water your household will need in the busiest hour of the day. 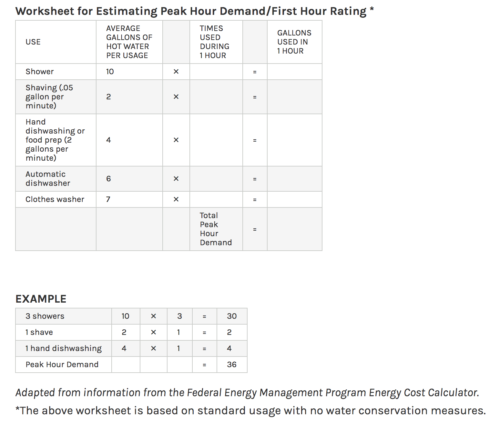 Step #2: Once you calculate your peak hour demand, make sure the water heater you choose has a first hour rating (FHR) that falls within 1-3 gallons of that number. 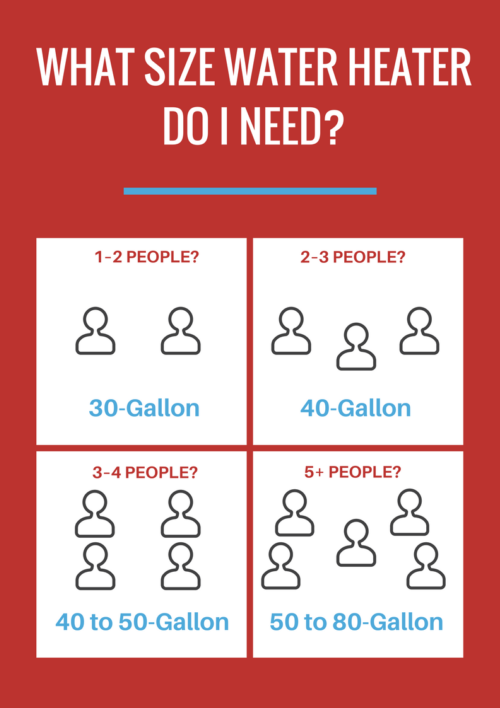 Example: If you determine that you need 42 gallons of hot water during your peak hour demand, you’ll want to make sure that your water heater has an FHR between 39-45. FHR tells you the maximum gallons of hot water a tank can produce at any given hour. Sometimes called “1st-hour rating,” you’ll find FHR on the EnergyGuide label of a water heater. The 2 most common types of water heaters are gas-fired water heaters and electric water heaters. Gas water heaters are generally more expensive to install, but they’re also cheaper to operate than electric water heaters. (that’s because gas is typically a cheaper fuel source than electricity). Basically, the more energy efficient the water heater, the more expensive it will be. To find the EF for a particular water heater look on the water heater’s manufacturer label or, if you’re searching online, look in the product details (seen in the image below). Our recommendation is to find a water heater with an EF of 0.60 or higher for a gas water heater, and an EF of 0.90 or higher for an electric water heater. 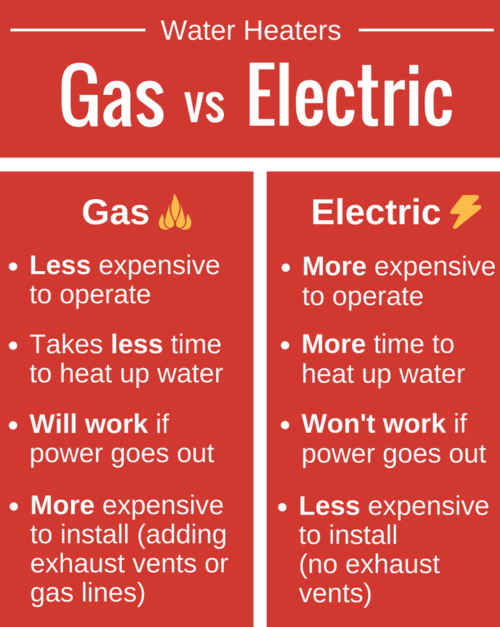 Note: Even though electric water heaters generally have higher EF ratings, that doesn’t guarantee lower operating costs because electricity is still more expensive than gas. When it comes to water heater installations, the bulk of your overall install price will go toward labor fees. The bottom line is, the more time and work it takes to install a water heater, the more expensive the total cost will be. The better the contractor, the more they’ll likely charge for their services. But don’t let that scare you from hiring a higher-priced contractor because you get what you pay for. Quality installations often come with higher price tags—which means if you’re willing to spend a bit more on labor fees, you’ll avoid wasting money on problems caused by an incorrectly installed water heater. Live in Phoenix? Need a new water heater? We can help. Just give us a call and we’ll send over one of our trusted plumbers to give you an honest estimate to install a new tank water heater. Want to learn more about our plumbing services? Visit our plumbing installation page to learn more about what we offer and what you can expect when you hire us. What’s the Cost of a Main Sewer Line Cleaning in Phoenix?